To continue our journey through Lincoln Park’s Lost Landmarks we will head about six blocks south from the old jail on Kalamath St. to W 8th Ave.The Barnard Block building showcases one of our neighborhood’s original mixed-use, transit-oriented developments, with retail on the ground floor and “tenements” above. The photo places it at the crossing of two streetcar lines. Unfortunately, like many of our original structures, it would ultimately crumble from neglect. The image below offers a glimpse from around 1900, with the original four floors of tenements above the street level shops. 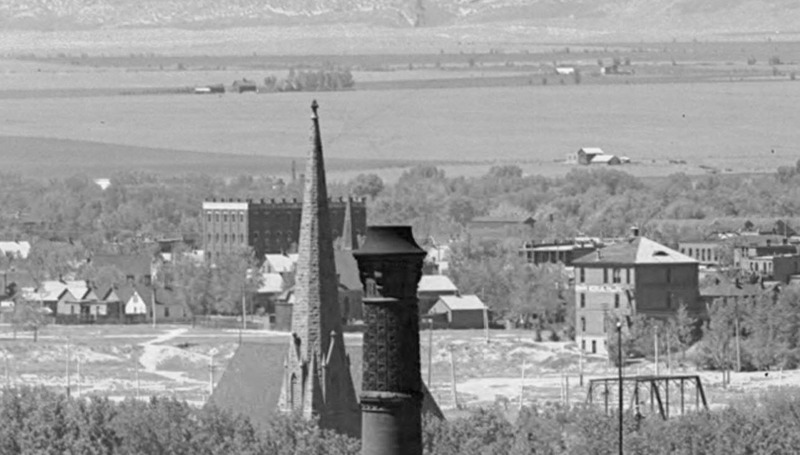 Visible in front of it, is the spire of Smith’s Chapel at 9th and Galapago (today’s Inner City Parish). We can also see the Eleventh Street bridge across the Cherry Creek below the Neighborhood House structure. 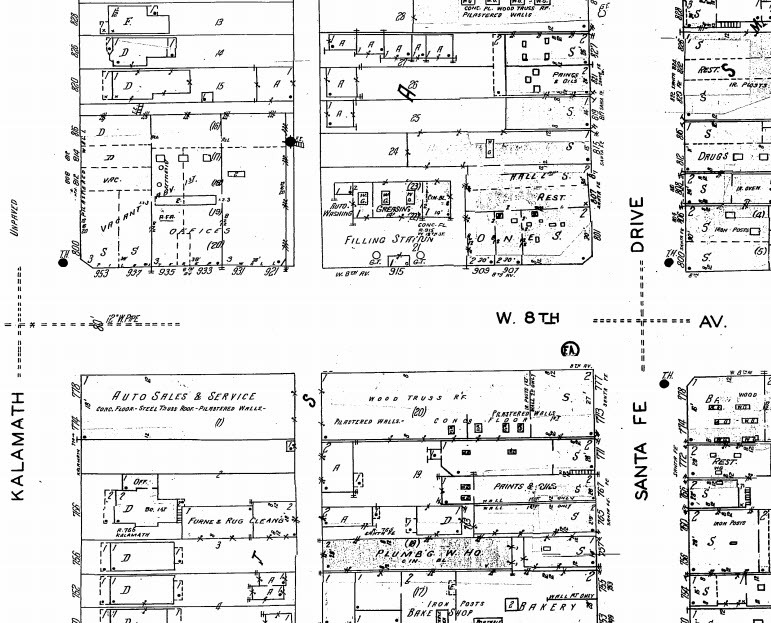 There is no reference to the building on the 1890 Sanborn map but it does appear in 1903. 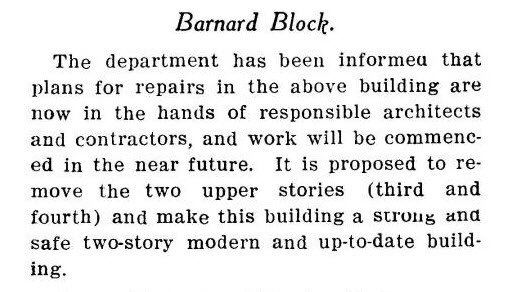 It seems that from early in it’s history, the Bernard Block’s residents were not necessarily the city’s most well-to-do citizens. The map below helps place the image. The streetcar lines intersecting at 8th and Kalamath are visible on it. 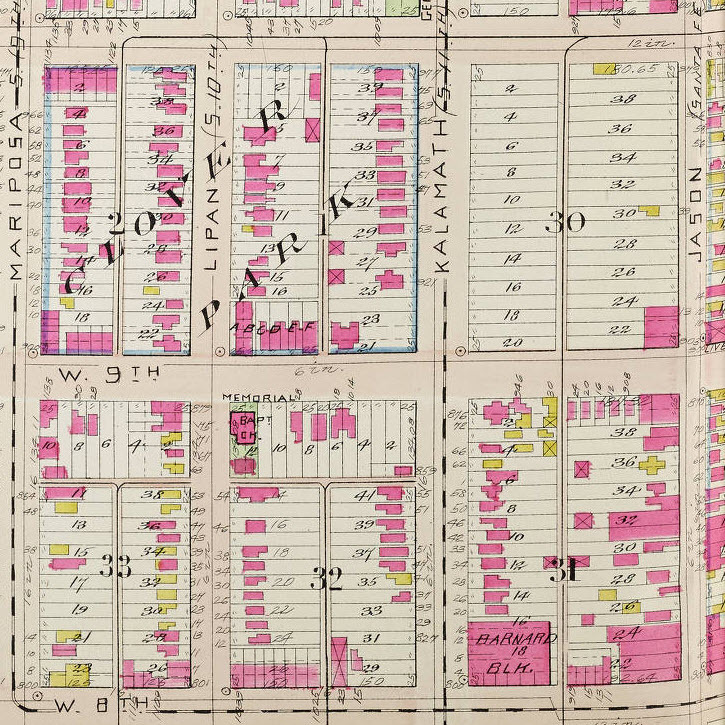 By 1909, the city condemned the property. An update. The building will be reduced and repaired. Shortened by now, the ground floor houses a candy factory in 1929. These maps also offer a picture of the surrounding uses: two auto sales and service shops, a creamery, and a drug store. 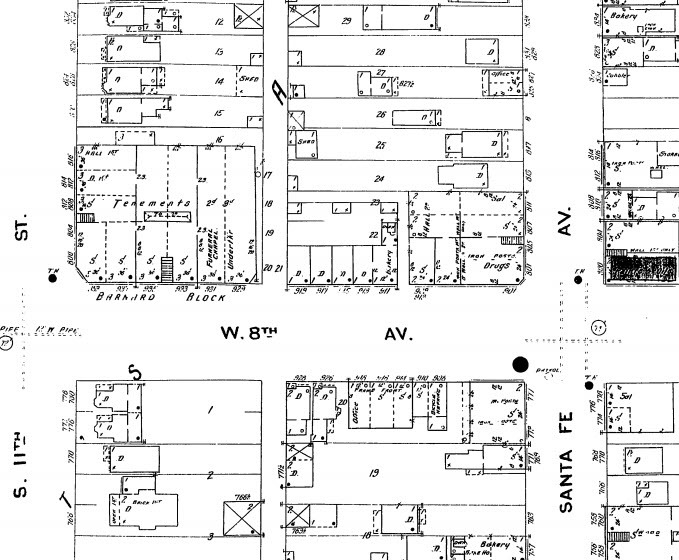 The 1951 map shows the corner shop as VACANT. A likely sign of what’s to come. Famed ‘New’ Barnard Block Is Crumbling, Wreckers’ sledges and bars are crumbling the famed “new” Barnard block at West Eighth avenue and Kalamath street. It was constructed around 1892 and is a landmark of the gay nineties. 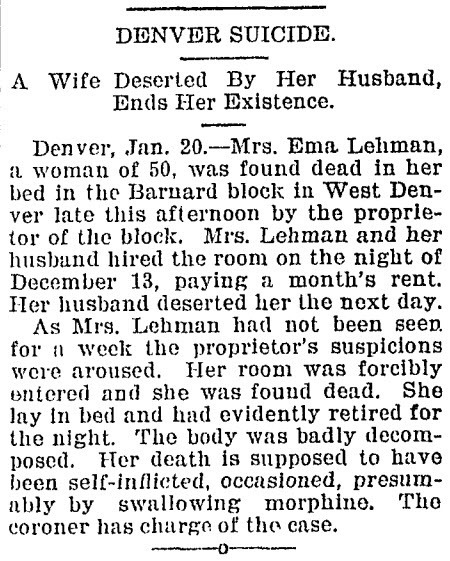 From the Denver Post 1951 AUG 2. It describes H.W. Barnard as a wealthy pioneer businessman and cattleman that built Denver’s “first so-called skyscraper” with this building. The upper floors were called the “Iona Apartments” then “Casa Loma,” and were once inhabited by “many social leaders of that more leisurely day…before moving up to Capital Hill.” In the summers, it was filled with performers from Elitch’s theater productions and housed some Hollywood up-and-comers, such as Douglas Fairbanks. Some old timers recalled fond memories of climbing a steep, winding staircase to deliver groceries, laundry and sacks of coal to those dramatic residents. It also was known as a center for “business”, housing a mortuary on the SE corner that was reputedly used in evenings as “boxing arena and poker palace.” Evidently, caskets make good hiding places during police raids. 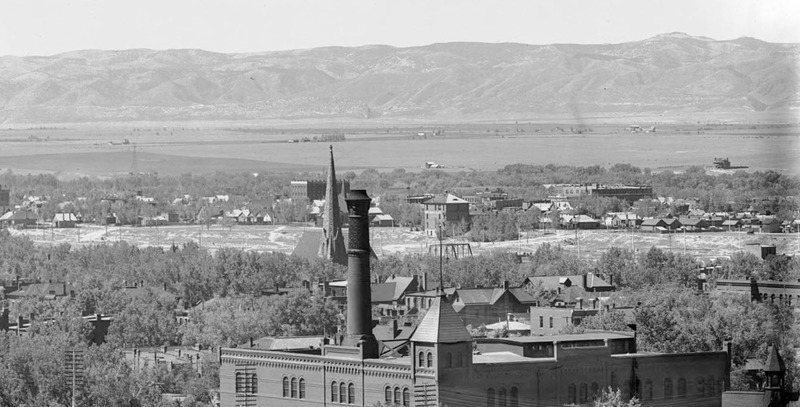 Machinists from the Denver and Rio Grande also reportedly opened Colorado’s first “co-operative store” during a difficult strike in 1907. The building was owned by the Van Hummell family since 1908, and housed their Van Hummell, Inc. insurance company’s offices there for many years. 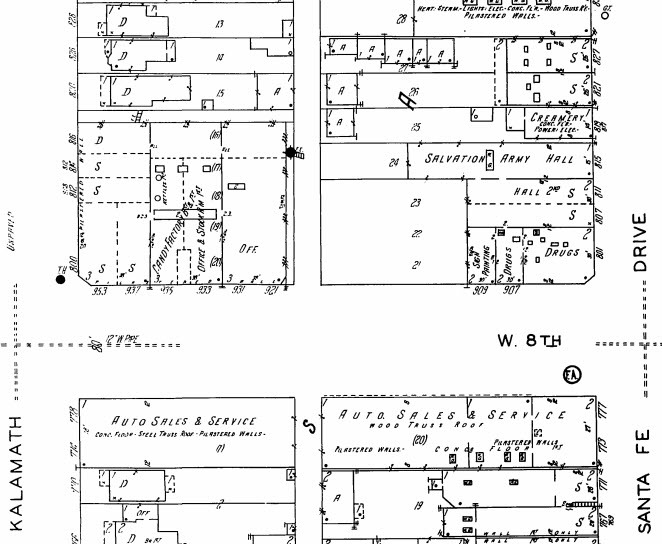 Denver Sanitary Laundry was another ground floor use noted. Condemnation would come again by 1951, when it was discovered that a presumably solid concrete foundation was actually crumbling brick underneath.